In today’s rapidly changing and highly competitive markets, many privately held companies are creating outside advisory boards to give owners and CEOs fresh, knowledgeable advice. Even for small businesses, setting up an advisory board can give you a significant advantage over competitors that are relying solely on internal talent. An experienced and well-connected board of advisors can help your business grow and prosper in ways you’ve never imagined. An advisory board is an outside group that is informally organized to provide business owners and corporate leaders with support, advice and assistance. While formal boards of directors have legally defined responsibilities and fiduciary duties, advisory boards have no formal power or binding legal authority. They serve at the pleasure of the business owner or CEO. Increased corporate accountability and discipline. Enhanced CEO and management effectiveness. Greater credibility with investors, vendors and customers. Help in avoiding costly mistakes. Rounding out skills and expertise lacking in current management team. A sounding board for evaluating new business ideas and opportunities. Enhanced community and public relations. Improved marketing results and effectiveness. Strategic planning assistance and input. Centers of influence for networking introductions. Crisis and transition leadership in the event of the death or resignation of the CEO. Help anticipating market changes and trends. Analyze the strength and weaknesses of your current management team. Look for critical areas of expertise and knowledge that your company could use help with such as marketing, legal, finance, eCommerce, and research and development or information technology. If your company is planning on going public within the next few years, seek out advisors who have successfully taken companies down that path. 1. What are the main areas we need advice and guidance in? 2. What specifically do we need the board members to do for us? 3. Who are a few potential candidates for board membership? 4. How do we avoid giving away too much control to outsiders? 5. What will be the powers and limitations of the board? 6. What will setting up the board cost initially? Annually? Will it be worth the cost? Determine the size and structure of your board. Advisory boards range in size from two members to over thirty. The right size depends on many factors, such as your company’s size, complexity, stage of development and individual skills needed. My experience and research has found that for most small to mid-sized, growing companies or start-ups, a 5 to 7 member advisory board is an ideal size. Smaller firms can start with just one or two members and add new members as they grow. Determining whom you invite to join your board is one of the most critical decisions in setting up a board of advisors. Often a business owner’s first instinct is to ask friends, family members or professional advisors to sit on their board. This is usually a mistake. Unless your friend or family member is a recognized authority in an area of expertise lacking by your management team or a highly successful entrepreneur, they are probably not the wisest choice. Another reason to avoid asking family or friends to join your board is lack of objectivity. Often advice from a friend, family member or management insider is sugar coated to protect relationships. An outside advisor can give you a much more objective and honest assessment of the situation. Using professional advisors such as your lawyer, banker or accountant as board members has it’s own pitfalls. These advisors are already working for you and may not be as objective as you need, due to having an interest in generating future business from your company. Develop a candidate profile. After you have determined the areas of expertise your company is in need of, create a profile of candidates that successfully fit these needs. Take care to address knowledge and skills that your company will need to meet projected growth and future challenges. Seek out experts. Search online and offline for experts and proven leaders that meet your candidate profiles. Contact them and begin discussions about possible board membership. Ask for recommendations. Solicit recommendations from the experts you speak with that cannot serve on your board, of collogues of theirs that they feel would be a good fit for your needs. Begin networking with your attorney, accountant and other professional advisors. Once you have successfully recruited an advisor, he or she can often lead you to another good candidate. Find your candidates motivation. Most of your candidates are not going to be motivated by money alone. In fact, if money is their primary reason for joining your board, they may not be what you are looking for. The most effective board members are motivated by the challenge and intellectual stimulation of building successful companies. They serve because they are already high achievers and enjoy the challenge. Have variety in your board. Try to include experts and successful entrepreneurs from several different disciplines. Often board members who are successful marketers, CEOs and business owners from different industries can bring a fresh perspective to your business. These individuals can often help you incorporate best practices from other industries, into your own industry, creating revolutionary changes and opportunities. Look for a proven track record. Find the leaders in their field. The best board candidates are successful CEOs, business owners, professionals, university professors and consultants who have achieved success in their own businesses and careers. Clearly communicate your goals and objectives. Invest time in talking to and meeting with potential members. Communicate to them what your goals and objectives are. Let them know that you are not looking for “yes men” and that you want advisors who will challenge you and hold you accountable for your businesses growth. Board members expect and deserve to be compensated for their time, efforts and advice. Typical advisory board compensation includes a stipend from $5,000 to $25,000 per member, per year. Some companies pay their board members per meeting, with payment ranging from $500 to $3,000 per meeting, with a monthly retainer of $500 to $2,500. Companies should also cover transportation, meals and lodging for members when attending meetings. Most successful boards also give or require members to buy stock or some form of equity in the company. This gives the board members equity participation and a vested interest in the growth of the company. Members missing meetings. Because board members are usually running successful businesses of their own, they may not always be available for every meeting. However, board members should be made aware that attendance of board meetings is important and expected. If a member is chronically absent, the value of their membership on the board should be reviewed. Insecurity of senior managers. Some company insiders may feel intimidated or threatened by the involvement of outsiders. The CEO or owner must make every effort to communicate to his staff the benefits and importance of having a board of advisors. Incompatible personalities. This is a challenging situation, because most members of your board will be strong willed, achiever types, who have gotten where they are by taking charge. Many will have strong convictions about their opinions and may find it hard to defer the leadership of the meetings to the CEO. You must determine when a member’s personality is “too strong” and becoming disruptive. Excessive number of board members. Because of their strong personalities, if you have too many members on your board, the more assertive members often dominate the debates, depriving you of the contributions the quieter members may have made. Lack of CEO communication. Withholding company information or not regularly communicating with the members of your board of advisors destroys trust and effectiveness. Regular communication between meetings is essential to maintaining an effective board. Inadequate compensation. As I mentioned, you do not want compensation to be the determining factor in a candidates membership on your advisory board, however successful individuals of the caliber you seek expect to be fairly compensated for their time and knowledge. If you build it, use it. Owners and CEOs who invest the time and money in creating a board should be committed to soliciting and using its advice on important issues and decisions. Value their input, even when they disagree with what you want to do.Sometimes a board is at it’s most valuable when it recommends against a course of action the CEO wants to take. If you recruit a good board, often they have already been down the path you are on, and their experience (and past failures) can help you to avoid costly mistakes. Communicate with your advisors. Keep the members of your board informed about what is happening in your company and industry. Counsel with individual members on the phone at least monthly and send them information well in advance of your meetings, to help them prepare and keep the meetings productive. Hold regular meetings. Most boards meet once per quarter. However, boards should meet more often during times of rapid growth or if company needs merit additional oversight and guidance. Have an objective for each meeting. Your board members are busy people and their time is valuable. Make the most out of your meetings with them, by having a clear agenda and objectives for each meeting. Make sure to cover the most important items of business first, in case the discussions take longer than planned or some members have to leave early. Annual assessment of board performance. Periodically assessing the board’s effectiveness is a critical factor in ensuring a good return on investment. Each year the board should set performance goals and define their criteria for success. At the end of the year the CEO and the board should assess it’s performance, compared to its goals and criteria for success. Over 80 percent of all private companies are operating without a board of advisors or board of directors. Odds are your competitors do not have one. Because of this, developing a board of advisors can give your company a distinct advantage over your competition. This is particularly true for start-ups and family run businesses. There is tremendous value in receiving objective, knowledgeable advice from a board of advisors who share in the financial and equity growth of your business. 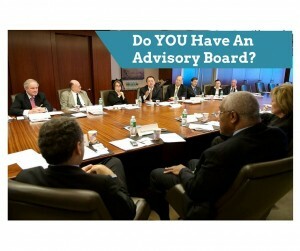 I encourage you to begin recruiting your advisory board today!